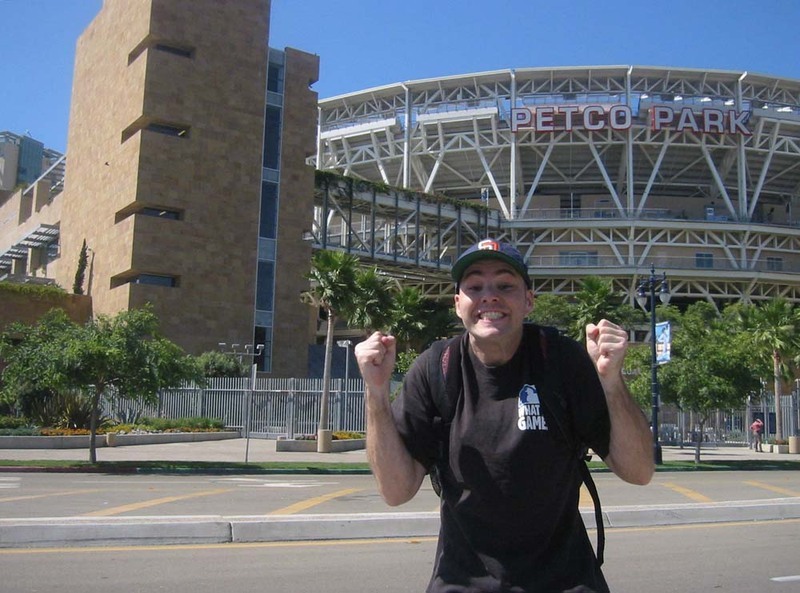 This was one of 54 pics I took outside the ballpark, and no, they weren’t all of myself. I photographed the ticket windows, the turnstiles, the street signs, the surrounding construction, the team store, the VIP entrance, the Park at the Park (a three-acre grassy picnic area with a mini baseball field behind the batters eye), the vendors, the autograph collectors, and a frighteningly large Armando Benitez. 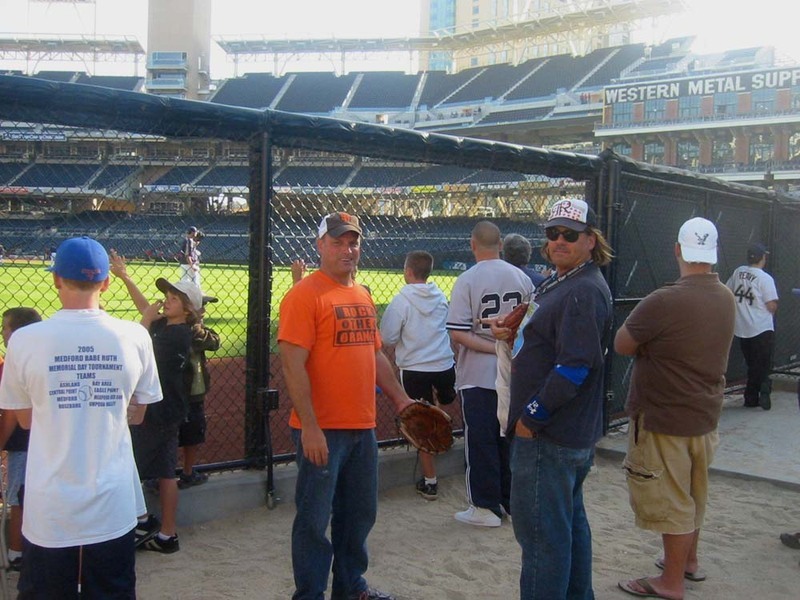 The stadium opened at 4:30pm, but for the first hour of batting practice, the only open section was the giant sandbox (and worthless bleachers), in right-center field…so there I was, trapped with dozens of little kids, 402 feet from home plate. Not good. I hadn’t even been there for a minute when I heard someone say my name…or at least I thought I did. The voice was so soft that I was almost tempted to ignore it. Yeah, it was a bit of an honor, I suppose, to be recognized 3,000 miles from home, but I kinda just wanted to go about my business and blend in. But I couldn’t ignore it. That’s not my nature. I had to turn around, and when I did, I saw two guys waving me over from the first row of the bleachers. They said they recognized me from this blog and knew I’d be there. One of the them–Kevin, pictured below in the orange shirt–told me that he was the fan who’d helped me identify Brad Hennessey last year in Cincinnati right before I got my 2,600th ball. That was one of 142 major league games he attended in 2005. 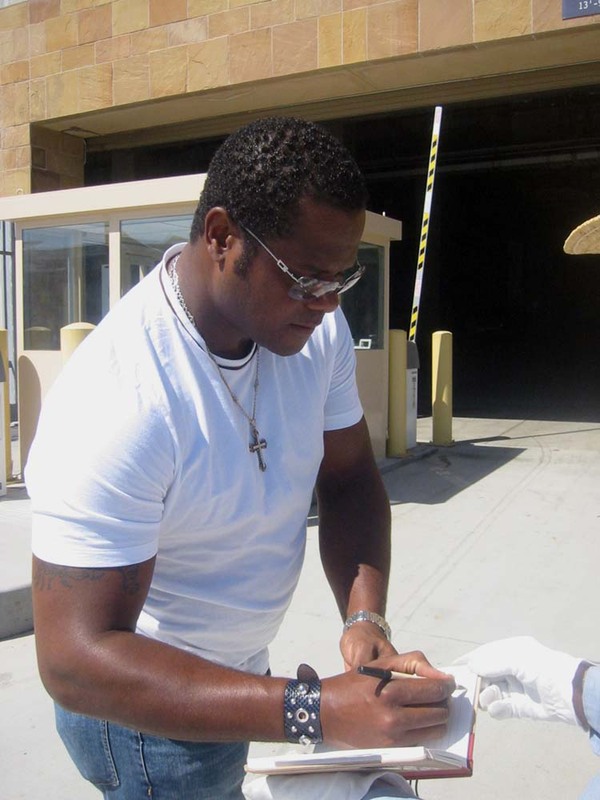 The other guy–T.C., wearing the sun glasses and blue wristbands–told me he’s caught 172 home runs during games. Five or ten minutes later, I got Scott Williamson to toss me a ball. I was surrounded by kids, but I was the only one who had called his name, and he lobbed it right to me, over the outfield wall and into the sandbox. No problem, right? The whole section (Kevin and T.C. excluded) erupted in protest. In the next 45 minutes, several balls were tossed into the section, and I was too rattled to go for them. I mean, I went for them, but not aggressively. On one ball, for example, I decided that I wouldn’t jump…that if I happened to get it by simply reaching up for it, then it wouldn’t be my fault. Of course, some other big guy jumped at the last second and snatched it away from everyone. And that’s how it went. It was weird. I felt guilty and undeserving, I guess because it all seemed too easy. I could’ve dominated out there and easily gotten three or four balls, but instead my niceness/wimpiness left me with just that one ball by the time the rest of the stadium opened at 5:30pm. I didn’t know where to go. I tried right field and didn’t get anything. The stadium was packed. I ran back around the batters eye and into the left field seats. Awful. 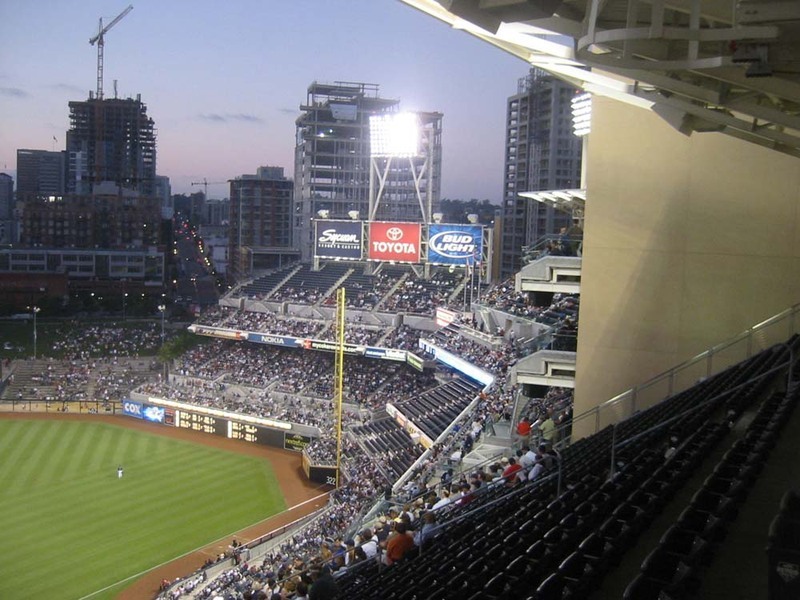 The long rows were filled with fans and blocked by railings at each staircase, and anyway, the second deck was so low that most of the home runs didn’t even land in the lower level. I ran back to right field. Still nothing. It was a nightmare. I ran back to left and found a teeny patch of empty seats down the line. Barry Bonds sliced a ball into the corner, and I convinced the recently promoted Jack Taschner to toss it to me. I had to beg. It was humiliating…and it was also the last ball I got during BP. Two lousy balls in nearly two hours? Unbelievable. The Giants are the new Astros: stingy beyond belief. I’m amazed they haven’t started marking their balls in order to keep track of every last one. I wandered and took a few more pics, then headed to shallow left field when Eliezer Alfonzo and some other guy started throwing. I couldn’t believe how little competition I had. In fact, there was NO competition. There wasn’t another Giants “fan” in sight. No kids. No gloves. Nothing. Just a few oblivious season ticket holders. When Alfonzo finished playing catch, I didn’t even have to call his name. 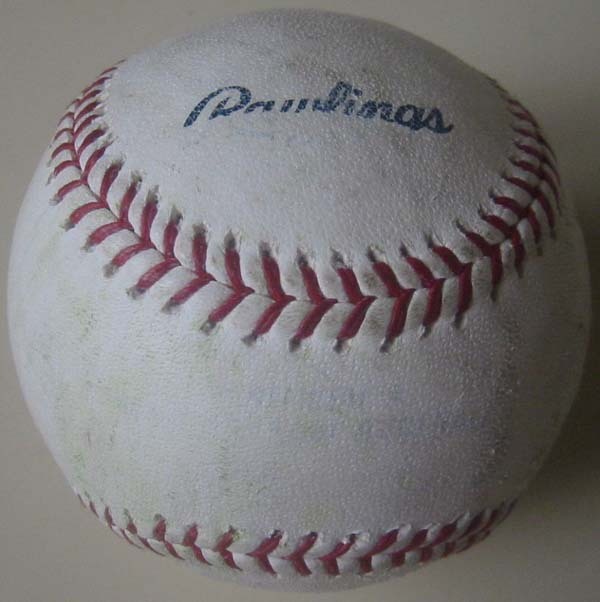 I just held up my glove, and he threw me the ball which, as you can see, is pretty weird looking. Aside from the thin strip of the word ‘Rawlings,’ the rest of the logo is barely visible. It looks like it was somehow wiped off, or cleanly smudged away. Any theories? After the national anthem, Randy Winn completely ignored my request to sign the ticket from his cycle. I was shouting at him (politely) from about 50 feet away, so I know he heard me, but he did his best Curtis Pride impression and then trotted back to the dugout. It was time to head to straight-away right field for Barry Bonds’ first at-bat. (“Booo!! !” Okay, now hit me a homer.) The Giants, of course, went down in order in the top of the first, so I had to wait out there for an extra half-inning, only to see Bonds lead off the top of the second by grounding out to the pitcher. BALCO should give him a refund. I needed to take more pics and thought I could make it to the upper deck and back in time for Bonds’ next at-bat, but no. Not at PETCO. It’s a pretty place–don’t get me wrong–but it was designed in the most inconvenient way imaginable. Aisles end unpredictably. Staircases lead to fences. Concourses are strangely disjointed. The whole stadium is basically a gigantic obstacle course. Getting from Point A to Point B is a real pain. So I wandered…as quickly as I could…and still ended up watching Bonds from the top of the upper deck. If he’d homered to my spot in right field, I might’ve jumped off said deck, but thankfully, the best he could do was ground out to first base to end the top of the fourth. • Competition Factor = 127,096. • 136 balls in 18 games this season = 7.6 balls per game. 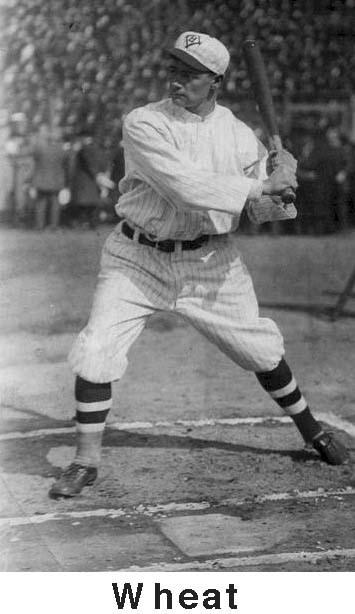 • 2,888 total balls…moves me out of a tie with Zack Wheat (2,884) and into sole possession of 35th place on the all-time hits list. Next up is Craig Biggio (2,905). That stinks bad that they are so pathedic at the new ballpark. The giants blow anyways so who cares if there nice or not. Well good night I suppose 4 balls isn’t too bad. Your only there for vacation right? I think Biggio is the only person you could possibly pass up, that could pass you back up this season(or next). He’s the active leader in hits(I think) and should get 3000 sometime next season. Who’ll get to 3000 first? Bidge or Hample? Hample. He gets them in bunches. Nice lineup cards, dude. Funny that the only name circled on them is pictured at the top of your post. Wow, PETCO’s a tough place, huh? 3 balls? I’m still going with 2900 from Hennessey. Better luck next game then. Hmm Arn’t you worried that you won’t get 2900 in San Diego, cause the 1st day seemed pretty rough, but if any1 can do it you can. 2900 is comming from Chan Ho Park. Hey Zack after noticing that Benitez pic by the player parking lot. Does anyone know where the player parking lot is at the Rogers Centre/ Skydome? The Giants sure don’t look like they “blow” these days. They’ve won the first two games by one run. Four balls is okay, though not quite enough as a per-game average if I want to reach 2,900 out here. This is just a vacation. Yes indeed. I can’t pass Biggio? Sure I can. Watch me. If I don’t catch him by the end of this season, I’ll almost certainly reach 3,000 next year before he does. Bunches. Yes. Glad you’re with me on that, and thanks for pointing out the circled name. I hadn’t noticed that. 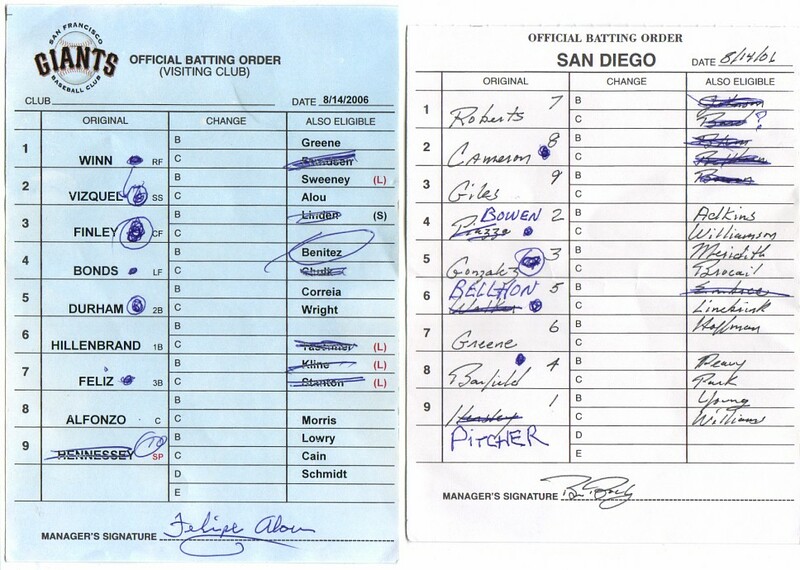 You think lineup cards are only worth five balls? I’d put that number a lot higher. Actually, right after I got ’em, some kid (who should’ve been old enough to know better) ran up and offered to trade me a ball for them. I don’t know about the Rogers Centre. Hopefully someone else does. Seems like there are a bunch of Jays fans here. PETCO is really tough, but if you look closely, you’ll see that I ended up with four balls. I got one at the end of the night from Luis Pujuls, right before I got the lineup cards. But yeah, I felt defeated pretty much throughout the day. The lineup cards (and that ball at the end) really lifted my spirits. Yes, I’m worried. No. 2,900 from Chan Ho Park? Maybe if he gets traded to the Mets within the next six days. Nice job Zack! Where is the best place to get balls and autographs at Kauffman Stadium? I will be there Labor Day weekend. 4 total was close to my guess of six, great job! you should have taken advantage in the sandbox and dominated! anyways im going to see angels vs. yankees on 8/26 with no BP. Any tips? SENOR:a yankees game arent you a redsox fan????? Yea I figure you’ll probably pass 3k first.. he averages about a hit a game and if you go to just one game a week, you’ll probably get more than 7 balls a week. oh wait, darn it, I just heard the sox are WINNING 5 to 4. Darn, no snide comments. Should be some thrilling games. OH MY GOD YOU GUYS BARRY BONDS HIT ANOTHER HOME RUN!!! I WONDER IF ZACK CAUGHT IT!!! Good Point Mets guy. How do u get those like do u scream at the coach or something or like do some gesture or beg or did he just give it to u. Seriously tell us what the deal is. Thanks. I don’t remember Kauffman too well because I was only there for two games back in 2001. It’s a pretty simple place. No fancy sections. 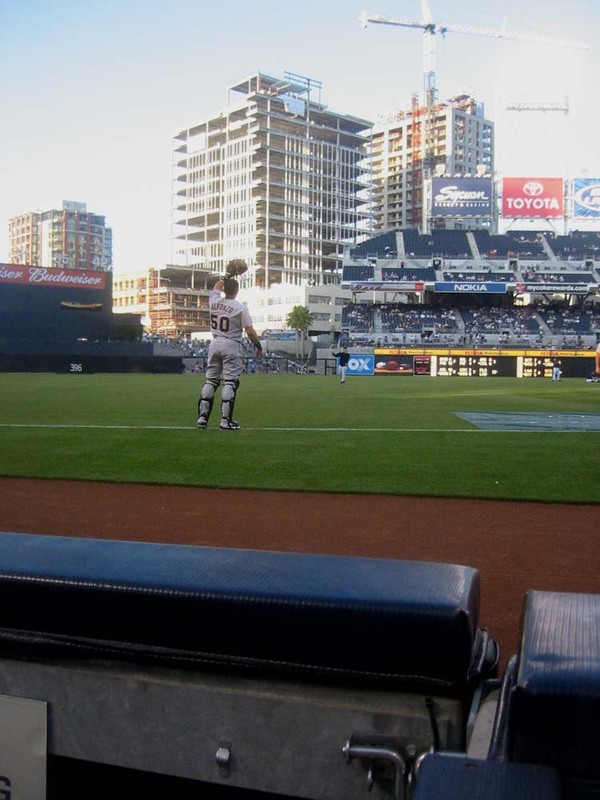 Hang out in the aisle that cuts through the seats behind home plate…excellent for foul balls. During BP, go for the corner spots all the way out past the foul poles in the front row…good for getting balls thrown to you. That’s about all I can tell you. You did make a good guess. It was my own fault for being a lame ball-snagger. Any tips, you ask? Yeah. Don’t go. You’re just gonna have to beg players for balls, so make sure you bring the rosters and a cheat sheet with their pics so you can indentify EVERYone. What you said also makes sense. Totally. I’m with you now. I did the same math…glad we’re thinking along the same lines. I’m not sure when I’ll get to check out your blog. I’m soooooo busy right now and struggling to keep up with my own. In the meantime, I hope lots of other people visit it. That’s hilarious about the ushers at Shea (and cool about Weirs Beach). Thanks for putting it into words. 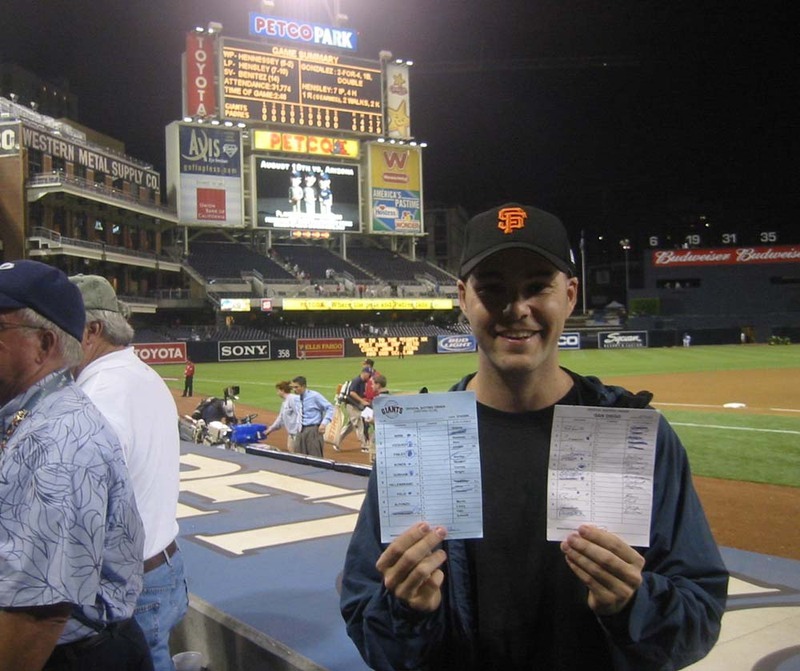 Getting lineup cards is easy, sort of. Just get down to the dugout for the last out of the game and yell at the coaches or manager and ask for them. (“Felipe!! Can I get the lineup cards? !”) You’ll probably get ignored 19 out of 20 times, but every so often, you’ll get hooked up. For the record, I’ve NEVER gotten lineup cards in New York. zack did you really catch it? Gustavo watch. After his poor outing Monday he will have ANOTHER rehab start his 4th sinc ehis injury. ESPN led each show this morning with the video of the HR, and you can clearly see who catches it. In addition, you can view the video on mlb.com by going to the wrap of that game. Congrats, that made your trip. Not many 724th HR balls in the marketplace. Zack, you’re a complete dork, but in such a great way. Awesome on the lineup cards. Boo on Randy Winn. I think a lot of newer stadiums feel “inconvenient” like that until you get to know them, and know where all the appropriate elevators/ramps/escalators/shortcuts/etc are. Hmm, I can’t entirely tell who caught Bonds’s 724 from the little mlb.com screen, but I sure hope it was you! Oh, but it WAS in right field. It’s true that I was in the replay. I’ve still only seen it online, and it doesn’t look that clear to me. Thank you thank you thank you. It IS hard to tell who caught that ball. I hope it was me, too. Did I catch THE ball? Only a few people know the answer at this point. I will say that I was right there. Details will follow, at some point. Soon. I hope. Oh my god, so busy, so tired…leaving for the airport in six hours. the tension is building up its driving me crazy! The guy who caught it appeared to be wearing a white t shirt. If Zack was wearing his black MLB shirt he didnt get it. Either way I dont think he got it. The black MLB shirt was in my laundry bag. Well I dont want to be goign with the majority here. If he didnt catch it id be the only one who was right :) If he did catch it then thats just as good if not better then beign right. Link to the MLB.com video? Funny, the sight of Benitez still gets me riled up–not in a good way! If you enlarge the pic, it looks like he’s signing Mickey Mouse’s book. anyway, I looked at ur post about ur pre-game checklist and i was surprised u made a post in it just on like tuesday! I added my post. Not only do i carry the pictures of each player/coach with there name and number, I also printed out a list-by number-of each player and there name, that way if I can’t see their face, I’ll have a faster way to find out who they are! I almost always wear my hat when I’m at a game. Mad skills? Thanks. I’ll answer your questions later, if someone else doesn’t first. Yeah, that white glove is pretty funny. …I’m leaving for the airport in like two minutes. Long flight (red-eye) back to NYC. I’ll be awake the whole time. Hope to get lots of writing done. I think it was Zack because the person was standing in the aisle, wearing a glove. That’s exactly what Zack would be doing. I feel like an idiot. I was yelling at Curtis Pride asking him for a ball. Needless to say, I didn’t get a ball. lol thats pretty funny about Curtis Pride. Anyway getting ready for one maybe two Royals games next week. ZACK — I thought you said that you were going to throw it back??? A **** of a catch …….. congrats ……. wish I could have been there but our team is in the middle of a penant race up here in Fullerton so I did not make it down. Maybe we meet up next year?? Ooh. Royals. Wish I could see them. Not many Royals fans out there. Wow that is funny about Curtis Pride. You should learn how to ask for a ball in sign language. I actually do know how to ask for a ball in Sign Language and have gotten several from Pride over the years.